Last year we extended the back patio and concreted over the oddly placed flowerbeds that were breeding grounds for mosquitoes. After much waiting and saving of dollars, we are moving forward. 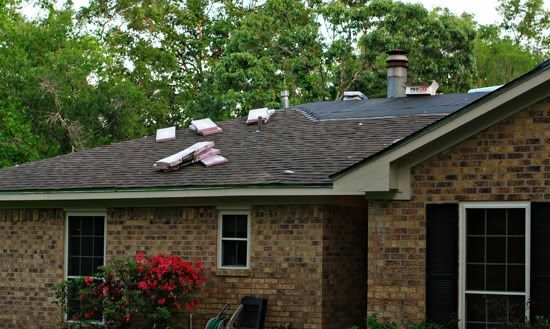 First of all, I am uber excited about getting a new roof. Being this excited about a ROOF makes me laugh. When I was little, I would watch The Price Is Right with my siblings. Whenever someone would win carpeting or bedroom furniture, I would be so sad for them. What's the fun in that?! Give me Plinko or a trip or a brand new car! And now I am that person. The one who is excited over flooring, a new roof, and boy does this house need new shutters! But I would never kiss Bob Barker or Drew Carey to get it. Blech. Can you see how BIG the windows are going to be?! You can tell a little better in this picture. Imagine that the bottom half is drywall. Eeeeeeeeee! I can't wait! This room is going to be a NO-TV room with bookshelves up to the ceiling along one wall, a ginormous walk-in closet (for all my crafty, sewing, and school things), and windows that look out onto the backyard (hopefully a cleaned up backyard!). There is lots of hammering and constructing going on around here. The thuds on the roof are so loud, I anticipate someone crashing through the ceiling at any moment. And in the middle of all of this, we are attempting to get a little school done... just the basics of math, spelling and language arts. Maybe tomorrow I'll be able to tackle the undone science experiments that are hanging over my head. Anyone have suggestions on shutters for the front of the house or ideas for window coverings (shades?) for the back windows? Did you watch The Price Is Right when you were a kid? What was your favorite dream prize? Oh how exciting!!! 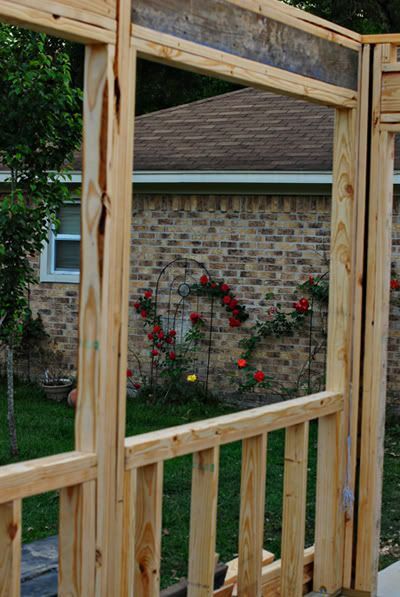 I can't wait to see the finished product on your addition. 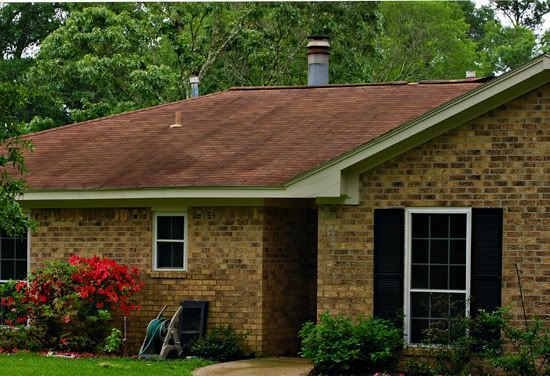 That new roof makes such a huge difference in the way your brick looks. I have no suggestions regarding shutters or window coverings. Are you going to put a sofa bed or something in that new room for guests? :) I'm so glad this is finally getting done. You deserve it Marshy! I love you!!!! YEah, how totally exciting. I am so jealous of the big room for books and crafts. Woohoo! Can't wait to see pictures. NExt week we get windows. Our house is almost 60 yo and has the original windows. It is totally going to change the feel of the inside of the house. That is so exciting.I'm happy for you guys. The new roof does look great and makes a big difference..I wouldn't put anything on the windows..Well maybe some curtains that can be pulled either to the side or pulled up..So that you have the view of the backyard during the day..Can't wait to see the completion pictures of your new addition.. I just have to comment. My mom (Nana) was on the Price is Right. Not only did she go but she was picked. Not only picked but she won the first item up for bid and played a game. Not only played a game but won the game and got to spin the wheel. Yes, our Nana won a pool table, TV with surround sound, a dining room table, an Oreck vaccum with a radio in the handle, and a washer and dryer. Oh, and yes, she did kiss Bob Barker and would do it again if she could!! that is so exciting! the back room is exactly what i want to do off our living room. a homeschool room with a big closet for the sewing machine. someday!!! when i win on the price is right. Happy with you for your new add on and roof. Wonderful! Yes, I watched plenty of Price is Right. CARS... always thought the cars were the coolest. 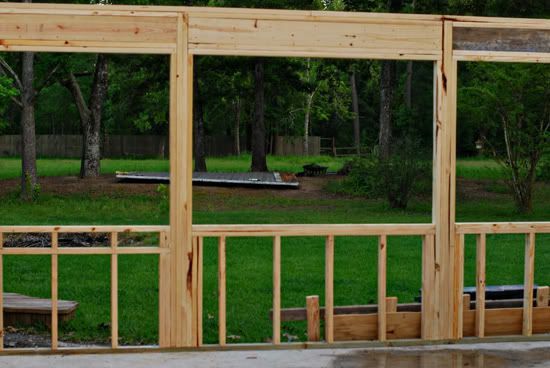 How exciting -- now I'm wishing we had added a sunroom when we built our house. :) It looks like it's going to be lovely. I'm for keeping the windows open and letting that sunlight it! Oh -- and Price is Right: "A Brand NEW CAR!!!" was always my favorite, but now it would be a vacation! Marsha I am so excited for you! It is going to look great! The roof already looks great! I am THAT person too now that I have a new house to decorate!! 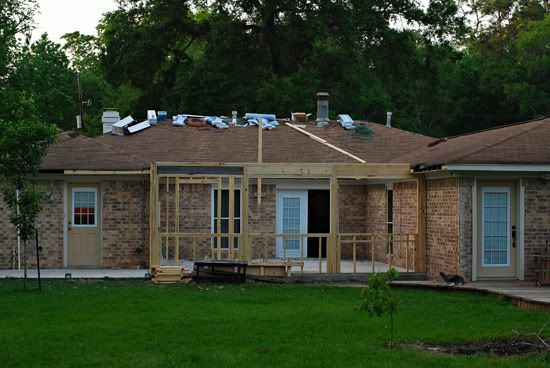 Be sure to share pics of the progress! I may need some inspiration! As for window coverings I would want a pretty and light fabric shade that would not block the light too much, and could be pulled up for the beautiful view. You can buy some great ones with different fabric choices and Lowe's or Home Depot. (or anywhere actually) Or you could be creative and make your own! I would avoid blinds though. Have fun with it! I'm so happy for you, Marsha! That will be such a fun addition for your family! I watched The Price is Right from the womb! Loved that show. As a kid I was always fascinated with the appliances, I loved them. Coveted them. Sweet! I dream of being able to add on. It already looks good Marsha! I never really watched much price is right growing up. All we had for tv was one channel that would come in if we twisted the huge antenna in our backyard just right. I don't blame you for being excited about the roof, the new one looks great. I love the sounds of the new room your building on. I'd love to have a room filled with books and my scrapbooking stuff. I did watch The Price is Right a time or two, but I Was addicted to Family Feud and Wheel of Fortune, you know, when the winner's face floated in a little circle above the showroom of prizes, and they called out "I'll have the Oreck with the radio handle for $200!" Your house looks like one could just walk on up and ring the bell and you would be so glad to see them! I wish I could offer advice on window coverings and what not....I was really impressed with the size of the future windows and the floor to ceiling bookcases!! The roof looks great and really makes the home look more put together. Okay, I'll end this comment now! Wow marsha! I am SO excited for you : ) What fun! I am a terrible decorater so I will spare you any ideas I have floating around. I know you will come up with something amazing! So excited for you! A dedicated space for school! A place for your STUFF. I love my space. I know you will too. I have patio envy!! Can I say that out loud?! We have a skinny patio that needs to be extended (read, grass ripped out & more concrete poured) and the roof to be extended. It would make SUCH a nice BBQ/entertaining area! Add in screened walls and I'm in heaven for summer! Your new addition looks as if it will be beautiful! Be sure to keep us posted with new pictures! I love your house! The brick is beautiful! I always wanted a brick house, but up here everyone has siding. Oh well, I'll just admire yours! The roof looks great and the addition is going to be awesome! I am loving these books for boys.